Clam Blitz is one of the four Ranked Battle modes in Splatoon 2, alongside Splat Zones, Rainmaker, and Tower Control. Clam Blitz is the first ranked mode introduced in Splatoon 2 that wasn’t in Splatoon. Clam Blitz was announced on 21 November 2017 when Nintendo released a video showing the updates for the coming weeks. On 13 December 2017 at 02:00 UTC, the 2.1.0 game update made Clam Blitz playable. The objective of Clam Blitz is to pick up clams, which are scattered around the stage, and deposit them into the goal near the opposing team's base. Once a player picks up ten clams, it transforms into a power clam, which is used to destroy the barrier around the other team's goal when thrown towards it. At the begining of the match, 30 clams are scatterd all around the center of the stage and towards the teams base. New clams in groups of 4 will appear at set intervals at certain locations in the stage. They can be picked up by going close enough to them. Each clam picked will have a higher note sound the more the player has until a power clam is formed by picking up 10 clams. After picking clams, the clams will start to trail along behind the player in humanoid form and dissapear when swimming in squid form, When standing still in humanoid form, the clams will form a pyramid shape. Clams and power clams can be thrown by pressing the or button. If a thrown clam or power clam hits another player, they will get it as if they picked it up. However, a power clam can only be picked up by players of the same team. A power clam when thrown to the ground paints the ground. If a player is holding a power clam, they cannot pick up any other clams. If a player receiving or picking up the power clam is holding any clams, they will be dropped upon getting the power clam. A player that gets splatted while holding clams will drop up to four of them. It is possible to Super Jump to a teammate or a Squid Beakon and keep all held clams intact, but returning to the Spawn point, either by Super Jumping or simply walking, will immediately break whatever clams or Power Clam the player was holding. After using the Splashdown or Baller specials, the player will drop all the clams or power clam they were holding. Any clams dropped (due to being thrown and not caught, splatting their holder, using a special weapon, etc.) will open up and break after a short while if not picked up. A power clam will similarly start flashing and then disappear after 10 seconds if not picked up by a player of the same team. After a power clam disappears or enough clams have de-spawned, new clams will appear in the stage in selected locations at groups of 4 clams. 30 clams are scattered around the center of the stage while some closer to Spawn, During the match, groups of 4 clams spawn in selected locations. 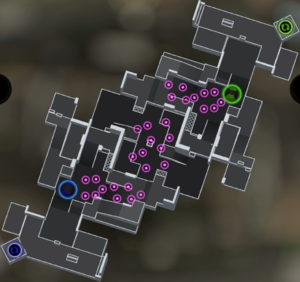 Clams on the player's team ink color will appear as pulsating circular markers on-screen (even through walls) and as dots surrounded by pulsating circles on the map. Both these markers are shown in the neutral color for the current match. 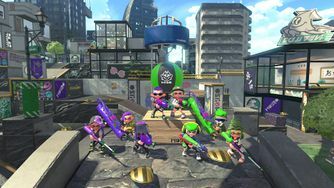 All players can see the position of both teams' power clams at all times on both the screen and the map, shown as a ranked battle symbol in white over their appropriate color. Once a player holds a power clam, it follows the player and can be seen even when in squid form. A dropped power clam (or the one that spawns when the barrier regenerates) will similarly be shown on all players' maps and screens in inverted colors (team color logo on white background). If the player is holding a power clam, or if the opponent's goal is open and the player is holding any clams, a marker shaped like a power clam in the opponent's color will appear on screen showing the location of the opponent's goal. Any friendly players holding clams (including the player themselves) will have a numbered marker showing how many they are holding above their name. In addition, the score board on the top of the screen shows the total number of clams currently held by each team, with power clams counted as 10 clams. Breaking the opponent's barrier with a power clam awards 20 points and lift the team's barrier up preventing the enemy team to score points. If several power clams hit the closed basket simultaneously, these points are awarded for each one. When clams are thrown in the opposing team's open basket, 3 points are earned for each clam, while a power clam is worth 20. If a team's barrier closes with the exact same point total as the opposing team, the last team to score will lose 1 point, a feature which is done to avoid tied scores. The barrier stays open for 10 seconds, and throwing a clam into it extends the timer by 3 seconds, but cannot make the remaining time go over 10 seconds. Throwing a power clam into an open basket will reset the timer to 10 seconds. When the barrier timer runs out the enemy team's basket will lift up to regenerate the barrier for 10 seconds, while the team's barrier will drop immediately making it easier for a counter-attack. When your barrier is open, it is impossible to open the enemy's barrier, as any Power Clam thrown at the goal will go back into the end zone as if the player had fumbled. If the barrier goes back up before the scoring team gets to 100 points, a penalty of half the points scored, rounded down, will be imposed on the team, similar to penalty for ceding control to the other team in Splat Zones. The total for this calculation includes the 20 points for breaking the barrier as well as any points that made up for previous penalties. If a point was deducted for the barrier closing with a tied score, the penalty will not be reduced (e.g. if the team only ended up scoring 19 points, the penalty will still be +10). In addition, a Power Clam for the team whose barrier got broken will spawn by their goal, and will not time out until picked up, no additional Power Clam will spawn if the previous one was not picked up and the barrier got broken and returned again. Several stages have a bump near the basket with the Sorella logo on marked all over them, the bump makes it easier to score and measure the distance needed to score a power clam. the losing team's barrier is open but they were winning when it was opened. the losing team takes the lead. 3 minutes of overtime pass. Clams and a power clam. Inklings playing with a miniature version of the game. The map, showing the location of each clam that is on friendly ink. An Inkling dropping their clams after getting splatted. A power clam behind an Inkling. A clam bouncing off the protective barrier around the goal. A power clam being thrown at the goal. The goal's barrier exploding after being hit with a power clam. The goal without a protective barrier. The goal with its barrier intact. Concept art of Power Clams and the goal. The Power Clam resembles an American football. It also has clams inside of it. The scenario where both teams have broken the opponent's barrier once and have scored no further clams (and the last team to score loses 1 point) is the only situation where a non-zero score is less than 20 points. The maximum number of clams that can be on the field while not held by players is 50. At some time early in the development, it appeared that spatting an opponent would have dropped all of their clams, not just a maximum of four. This can be seen during the 2.0 update trailer, at the 1:05 mark, where the green inkling is seen dropping six clams. This page has been accessed 58,052 times.